Fedje Church (Norwegian: Fedje kyrkje) is a parish church in Lindås municipality in Hordaland county, Norway. It is located in the village of Fedje, on the northern coast of the island of Fedje. 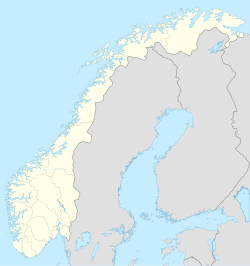 The church is part of the Fedje parish in the Nordhordland deanery in the Diocese of Bjørgvin. The white, stone church was built in 1941 by the architect Ole Halvorsen. The church was consecrated on 7 September 1941 by the Bishop Andreas Fleischer. It seats about 400 people. The church is built of stone/brick, which is better suited than wood for the harsh marine climate on Fedje. The roof consists of slate from Alta and the tower is covered with copper. There was an old chapel on the site that was torn down in April 1659, and on 21 August of the same year, a new church was consecrated as the first official church on Fedje. The church was not much larger than the chapel on the site—the nave was only 8 metres (26 ft) long. The church may not have been located on the present site, but rather on a small island north of the village of Fedje. By the mid-1800s, the church was in poor condition, so it was decided to replace the church. After a fundraising campaign, the old church was demolished in 1888 and a small wooden church was built. The new church was consecrated by Bishop Waldemar Hvoslef on 17 October of the same year. The church from 1888 quickly became too small for the congregation and in 1918 the parishioners began a plan to finance a new and larger church. In 1939, the church from 1888 was torn down, but unfortunately the start of World War II and the Invasion of Norway delayed the construction of the church. It was not until 1941 that the church was finished and on 7 September 1941 it consecrated by Bishop Andreas Fleischer. ^ "Fedje kyrkje". Kirkesøk: Kirkebyggdatabasen. Retrieved 2014-04-07. ^ "Oversikt over Nåværende Kirker" (in Norwegian). KirkeKonsulenten.no. Retrieved 2014-04-07. This page was last edited on 13 January 2018, at 05:29 (UTC).